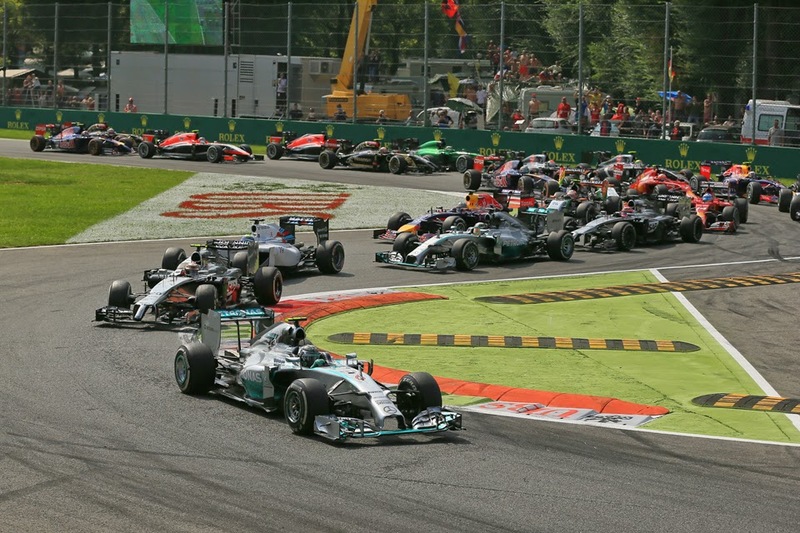 Talking about F1: The F1 blog: Italian GP Report: The day the story changed? Of course, it was only one race. But it may well prove to be so much more. Lewis Hamilton won out in the Italian Grand Prix today, and gets no more than the usual 25 points for it, as well as only a seven point swing to the table top. But again it may prove to be so much more. It felt a lot like that way. We know about the story that has persisted for Lewis for much of this campaign and in this title battle that is a very private matter between him and his Mercedes team mate Nico Rosberg. The feeling that no matter what little would go right for him. In today's Italian Grand Prix at Monza the story may well have changed. But in the early pages however the tale looked an incredibly familiar one. No one needed have worried about Lewis and Nico navigating the first chicane side-by-side after everything that had happened, as Nico even by that point was way ahead. There even was a couple of cars between. Pole-sitter Lewis's start was a stinker, due according to his engineer to a 'muddle' in his race start system, which seemed in the early laps to be slowing him too. Nico's lead rapidly was pushing four seconds. Already it looked a lot like it was all over bar the shouting. But Lewis's Mercedes gradually fined up, Kevin Magnussen swiftly was cleared, then he hounded Felipe Massa's Williams for second. And then things started to change to his favour around him, as Nico hit a bum note by straight-lining the first chicane, costing him upwards of a second of his lead. As if he'd established a scent, Lewis passed Massa pronto next time around, and - gradually but definitely - he ate into Nico's advantage. All held onto their hats. After their solitary stops it was much the same, before Lewis received a curious radio message from his engineer, asking him to maintain a gap of upwards of two seconds to Nico, in order to have the tyres left to attack at the end. It seemed something of a repeat of the Mercedes pit wall's error made in Hungary, rather micro-managing too much and being too beholden to their mathematical calculations. And just like then Lewis discarded the advice and decided that going by a pure racer's instinct was a better approach. Immediately he turned up the volume, setting the fastest lap to take four tenths out of the space to Nico who'd even so briefly set the fastest lap himself ahead. Lewis wasn't done and tore further chunks from the gap, getting to 0.7 seconds behind and banging in a lap time that wouldn't be matched by anyone all afternoon in so doing. Striking distance in other words. And so it proved. Lewis's approach had at least two benefits over that of the number crunchers. He'd be close enough to pounce decisively if Nico made an error. Also he'd be able, potentially, to pressure Nico into such an error. And that was exactly what happened. On lap 29 Nico once again straight-lined the opening chicane, and the time necessarily spent dodging bollards in the escape road was more than enough for Lewis to claim the lead. And it stayed that way until the end; Lewis in front put the hammer down to establish a gap eventually of 4.6 seconds, before then managing it to the end with the minimum of fuss. 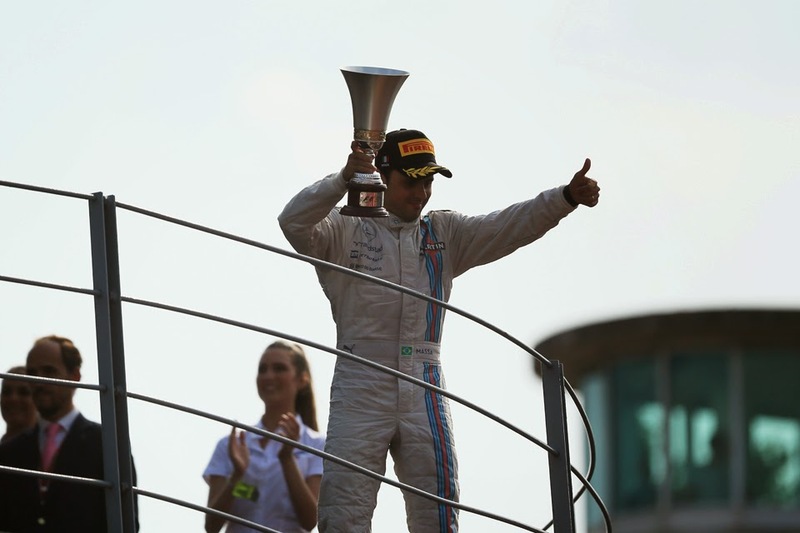 Felipe Massa was another to proceed with a minimum of fuss today, making good on his haughty position to bring his Williams home in third place, which proved a popular podium at a home race of sorts for him. As Valtteri Bottas suspected after qualifying the chatter of Williams beating, or even running with, the Mercs proved to be fanciful, but the Grove cars easily were best of the rest. Bottas himself meanwhile sank to P11 after a bad start and spent just about all of the rest of the afternoon it seemed passing people in order to rectify the situation. He was aided in this by his lightening-in-a-straight line FW36, which cleared many rivals, borrowing from the phraseology of another aggressive Williams racer in Alan Jones, like they were parked. Fourth place was his reward. There was then a frenzied gaggle of cars that battled pretty much throughout, made up of two McLarens, two Red Bulls and Sergio Perez in the Force India. It was the Red Bulls that came out on top, with once again Daniel Ricciardo coming out on top of two. The amazing Australian continues to amaze, that even in a weekend wherein he didn't look a factor, perhaps slower than his team mate, wherein he'd got a poor start (down to P12 indeed), he still managed make himself felt. Best of all it didn't feel at all like the first time this year he'd pulled off such a trick. This time it was down to a classic offsetting strategy; pitting later than those around him and cleaning up on fresher tyres later. And in another thing that didn't feel like the first time this year, Ricciardo's overtakes brought to mind what Rob Walker once said of Alain Prost's; 'So graceful and sure, almost like ballet'. 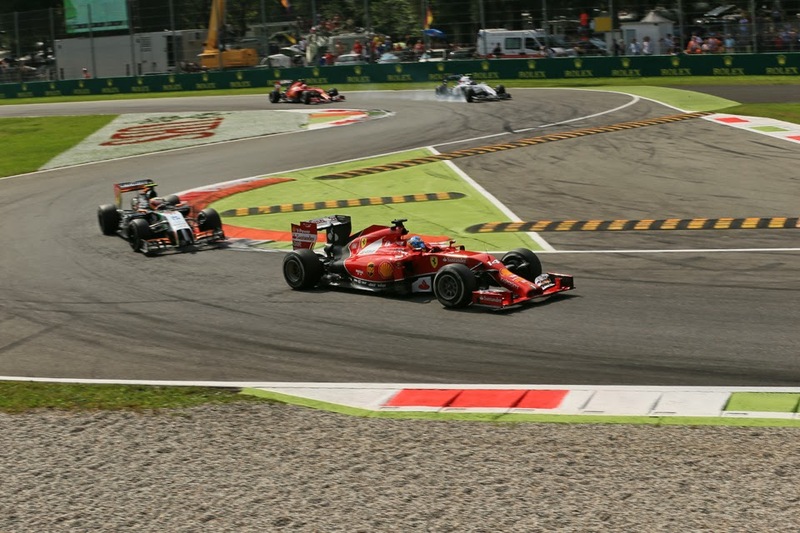 The Ferraris were somewhere in this vicinity too, but there the similarities ended as it was subdued and therefore desperately disappointing time of it for the home team at Monza. Fernando Alonso dropped out partway through with an ERS problem, while Kimi Raikkonen got onto the back of the gaggle mentioned for tenth over the line which became ninth thanks to a five-second penalty for Kevin Magnussen. In that latter case it was for something like that discussed on this site after the Spa race, of declining to give those seeking to pass on the outside sufficient space. While the matter itself that Magnussen was penalised for this time was marginal I'm glad that generally the matter is being dealt with. He later added that he 'loved every minute of it'. But as outlined at the start, is today about more? Is Lewis's being first at the end also a beginning? It felt a lot like one. Much changed, changed utterly in Monaco's qualifying earlier this year. Many unwanted records for Lewis started there. A few familiar voices wondered in turn whether it all had got 'inside Lewis's head'. But just about all of those unwanted records were ended in Monza. Perhaps more importantly too, for the first time since then, he'd taken Nico to the cleaners also. But of course it depends a lot on what happens next. This particular battle you suspect has a few places to take us yet. The Englishman also has plenty of ground to make up still and a points system that isn't the most helpful the sport has seen for someone chasing. But undoubtedly, and probably in the nick of time, Lewis Hamilton's championship chances today established a pulse. I don't want to read too much into this, but I thought it odd that Rosberg would make the same mistake twice. He's not exactly a rookie. Well it's a mistake Nico's made a few times this season. I can recall him outbrkaing himself in the race in Canada, Austria and Hungary, as well as in Hungary's qualifying (though in mitigation both the Hungaroring ones were in the wet). He came very close to the same in Spa, managing to give himself large flat spots instead. (He did it in Monaco quali too but I won't go there...). So I reckon there are reasons to think they were genuine errors in Monza. Otherwise, I thought Perez drove very well today. I saw Mag's penalty as a bit of an aggregate affair - while the proximate cause was his refusal to give room to Bottas, who was well-and-truly alongside, he'd also been playing games in the braking zone for the first chicane for much of the race up to then. The way he handled that area was very different from everyone else, who tended to move to the inside line smoothly and early, where Mag waited until very late (seemingly hoping to time it so as to tempt the following driver into moving inside, then effectively blocking without actually reacting to the other driver's move) and chopped across quite dramatically. He's showing good pace, but he's also developing the reputation of someone who can't be trusted in close quarters - I'm hoping the penalties rein him in a bit. Hi Rick. I've heard a few people express concern with how Magnussen has been defending his position lately, including moving, and moving late, in braking zones. We know he's driving for his future but he needs to be careful. It's all getting a little reminiscent of what happened to his predecessor in that McLaren seat Sergio Perez 12 months ago, where he took the team's desire to 'get his elbows' out too far and became a bit of a pariah for a while. If nothing else Magnussen doesn't need the penalties he's started to pile up.